I’ve been away for the weekend at the joint School Libraries Group, Youth Libraries Group and School Library Association conference Lighting The Future. 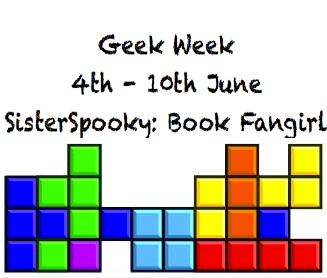 I’ll be blogging more about that at some point this week once I’ve gathered my thoughts and had a good night or two’s sleep, but whilst I was away I was also one of a number of bloggers taking part in the brilliant Sister Spooky’s Geek Week. The whole week has been filled with a brilliant range of posts about all things geek, I’ve enjoyed reading each and every one. My contribution was posted on Friday afternoon, I waffled on about Leverage and why I was a geek for it and thought other geeks would appreciate it. You can find it here and you can find all the posts here under the geek week label. It’s well worth a browse, there’s even a post by a Hollywood star! Previous Post The London 2012 Torch Relay. Next Post Things Before 30 – May. Geek Week was brilliant and I loved your post. Welcome back! Hope it was great.